I do so love a good outdoor party. I also enjoy being around people who are passionate about what they do and want to make a difference in the world around them. 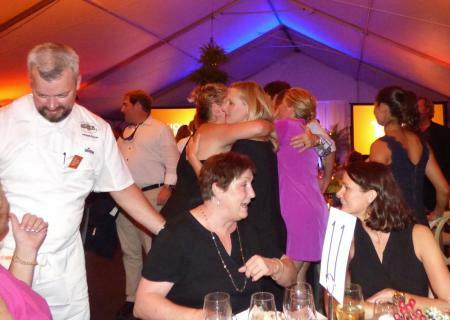 So, it’s no surprise that I really had a good time at the recent No Kid Hungry Dinner and Auction here in Charleston, SC . 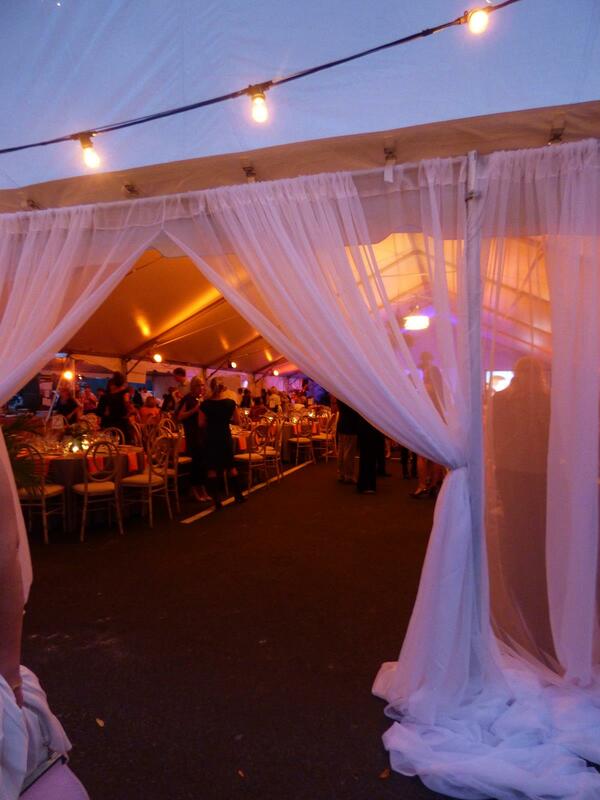 This was an outdoor party with impact – trying to end childhood hunger. 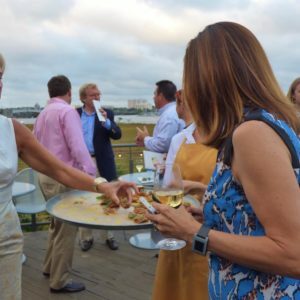 The event was held at the L’Atelier de L’Creuset on a patio overlooking downtown Charleston and under a huge sparkling tent. And it was an all star turn out of the top culinary talent in the Charleston. Guests enjoying the cocktail hour. The food was inspired and delicious. The weather was warm and breezy. The music from the band The Bushels was familiar yet fresh at the same time (blue grass version of “Billy Jean” anyone?). And the laughing relaxed crowd showed up to enjoy it all because they knew that together we could make a difference. Because 1 in 5 kids hungry is just not ok. 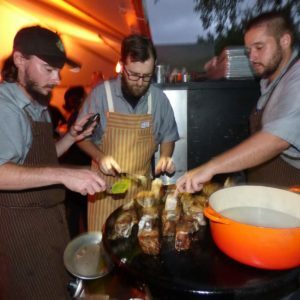 The chefs, staff, volunteers, and owners gave of themselves in an expression of what they do best- and put on one heck of a party in the process. Here in Charleston, SC we are fortunate to have world class talent in our kitchens. 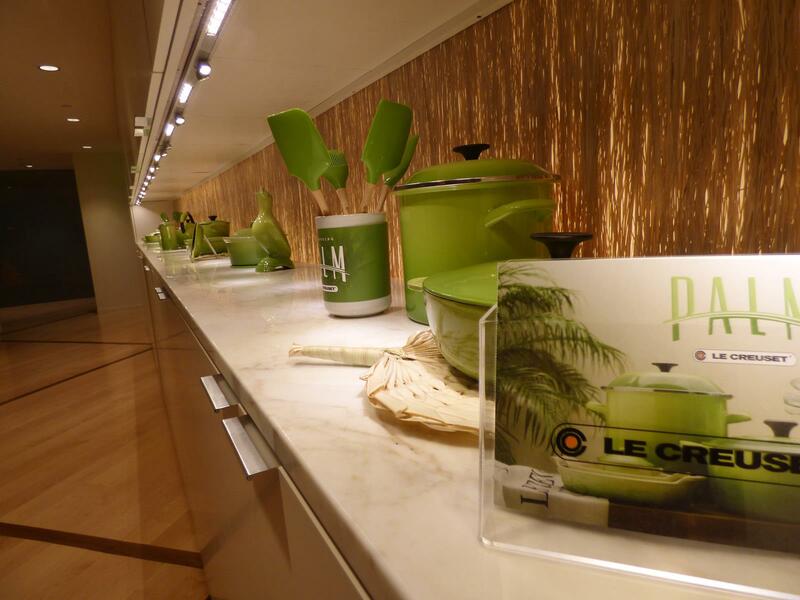 But there is something else that sets these chefs and restaurants apart. When asked to help, they consistently and willingly say “yes”. You simply will not find a more generous and giving group, who are willing to put their time and talent to good use. And boy, do they know how to throw a dinner party! Some of the top talent of Charleston’s vibrant Culinary scene lent a hand. 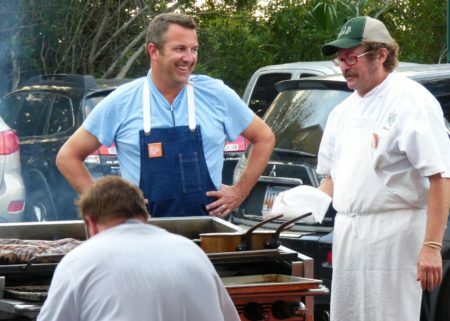 Chefs Johnson and Lee enjoyed a laugh while grilling . 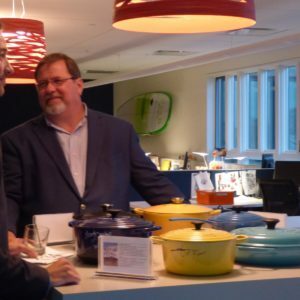 Hosting the event was Steve Palmer of The Indigo Road Restaurant Group and Chef Jeremiah Bacon of Macintosh & Oak Restaurants. 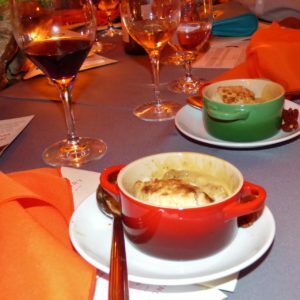 The twenty two chefs were grouped together to offer five different four course menus with wines to compliment. 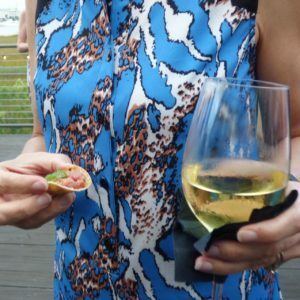 They began with a top notch cocktail hour where passed appetizers from the talented Anne Quatrano were offered. Chef Quatrano was the guest chef of the evening and is the executive chef and owner of a wonderful group Atlanta restaurants, Star Provisions. 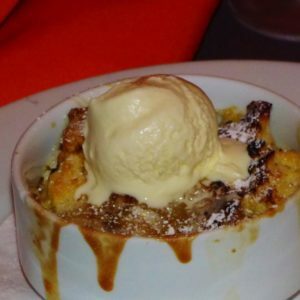 This includes the top rated and beloved Bacchanalia Restaurant. Her Dry Aged Beef Tartare was a standout of the evening. My favorite appetizer of the night. 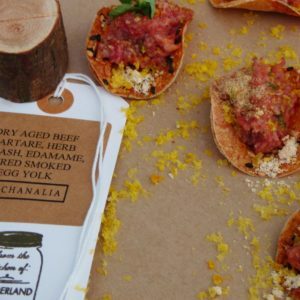 It had guests who had never enjoyed tartare change their minds and go back for seconds. It was fantastically classic and inventive at once. 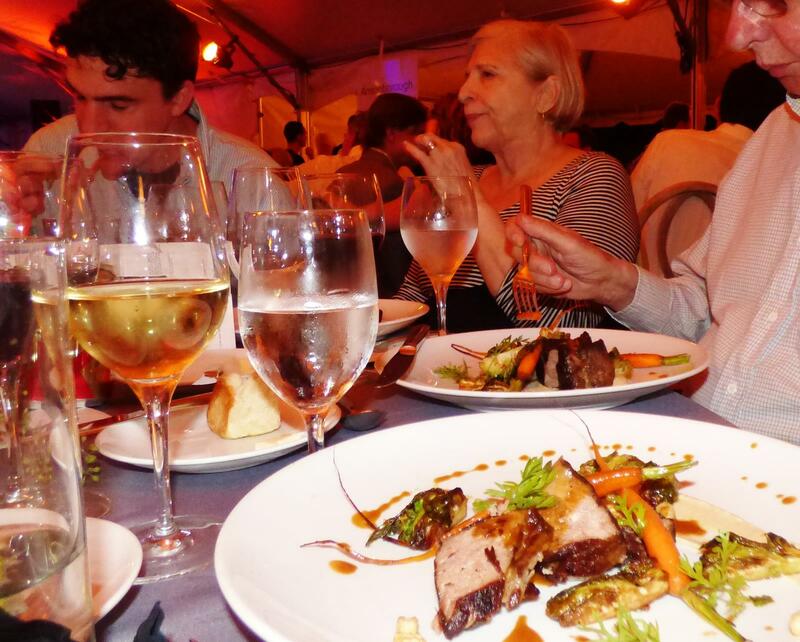 Once seated guest were divided into “neighborhood” groupings and enjoyed 5 diverse yet equally gratifying menus. 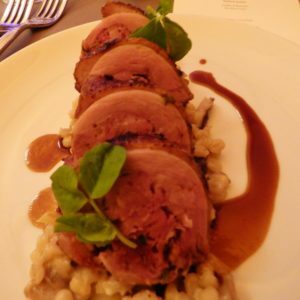 Jacques Larson of Wild Olive served Duck Roulade over Barley with Mepkin Abbey Mushrooms. Chef Andy Henderson of Edmunds Oast sears Pork Shoulder. I had the pleasure of sitting in the ”Outside Peninsula” section. 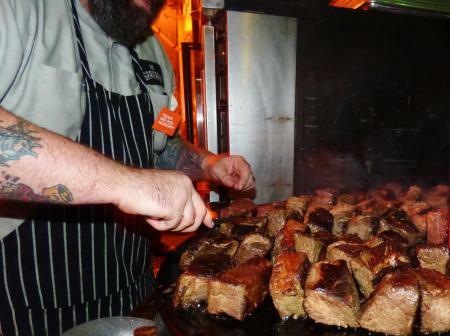 Another highlight of the evening was diving into Chef Brannon Florie’s Angus Short Ribs. 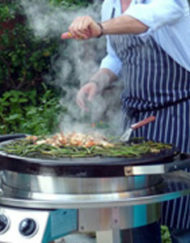 Chef Florie shows just how many short ribs he can sear at once on the EVO flat top grill. The meat was seared on our EVO Pro cart before being served with a smoked celeriac puree and brussels sprouts. The sprouts were elevated to a kind of “vegetable candy”. They were fried and dressed with sherry vinegar, maple syrup and shallots. They are available at his restaurant The Granary nightly- and I do suggest you give them a try! 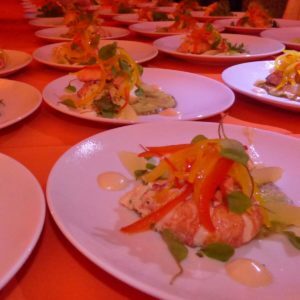 Chef Florie’s finished dish was enjoyed by all. Throughout the night there was a background of great live music. At my table, we enjoyed talking food between courses with the legendary chef Natalie Dupree and her charming husband, the writer Jack Bass. The night ended with an amazing auction that exceeded the event’s fiscal goals and had true life changing power. I am blessed to be able to say my child has never gone hungry. Providing adequate basic care and security for our children unites us all. I struggle to even imagining what it must be like not to be able to care for your child. To have to send them off to school or bed poorly fed or hungry. There is no food shortage in America, so this is a solvable problem. And Share our Strength is the exactly the sort of charity I like to get involved with; they utilize the people and organizations already in place to improve the problem one community at a time. They also have Young Ambassadors, Chefs, and Business partners to meet with local government and Washington policy makers. This makes a top down difference for all our communities. They partner with schools to offer free breakfast and summer meal programs. They provide education about nutrition on a budget and connect kids with available healthy foods.They also make it easy for us to help and get involved. It can be as simple as sending out a tweet for awareness. 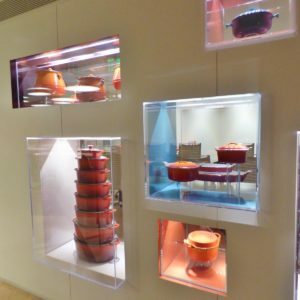 Choosing to dine at one of their partner restaurants. 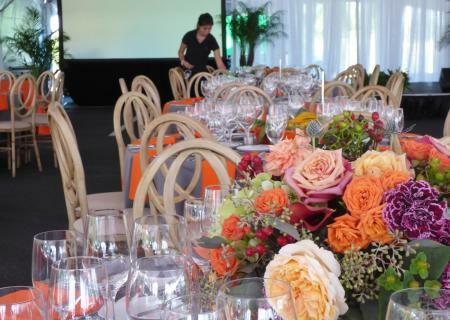 You can give of your time or attend an wonderful event. Here’s a link with ideas on how to help. 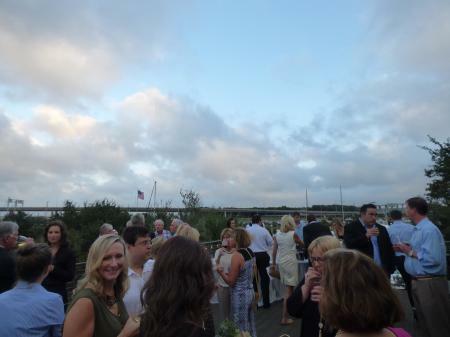 OutdoorLUX.com and EVO have been involved in the Share our Strength dinner in Charleston for the last two years. This year at the No Kid Hungry Charleston Dinner on October 12, I witnessed firsthand the difference a community coming together can make. And I am inspired to do more to raise awareness and money for this campaign. Since the economic turn down in America, our national hunger problem has been at a record level. It has come with a too large a price for the health, happiness, and educational performance of millions of our children. But the good news is that it is solvable. I hope you consider finding at least a small way you can help today. As little as $5 can buy 50 meals for kids in your community that need help. Here’s a link to donate $5 easily. Chef Jeremiah Bacon checks in with guests at tables. Here at outdoorLUX.com we have decided to donate 10% of all our profits from sales online during the next 30 days towards helping to end childhood hunger in South Carolina. Speaking with Jeremiah Bacon at the recent gala, I was struck by his “can do” optimism. He told me of his recent trip to Washington, DC and how he believed we could end childhood hunger here in South Carolina and show the rest of America that it can be done. We would love to be part of that story. Wouldn’t you? 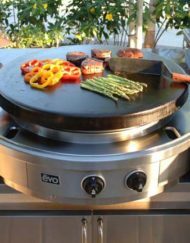 So maybe you have your eye on an EVO Procart for your husband for Christmas. Or maybe you need a luxury double wine bag from BOCONI filled with favorite wines for a newly married couple. 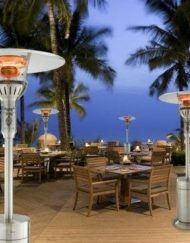 Or perhaps you need an EvenGlo patio heater to extend your outdoor season. Go ahead and buy it online with outdoorLUX and you become part of the success story. Perhaps you would consider going over to No Kid Hungry directly and making a donation or offering your time to become part of the solution. 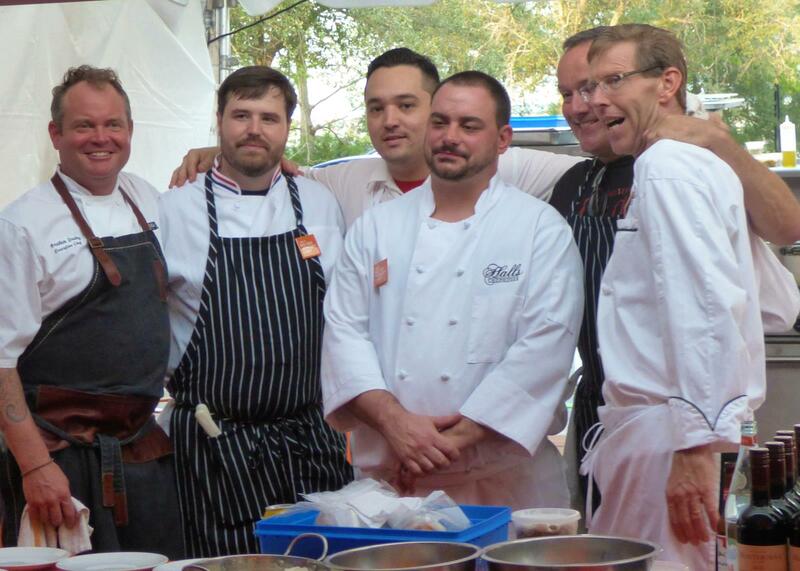 Chefs Graham Dailey, Thad Stuckey, Jason Stanhope, Frank McMahon, and Matthew Niessner were among the talent in the outdoor kitchens. And please consider supporting the chefs and businesses that put on this outdoor party with impact. What a worthy cause. 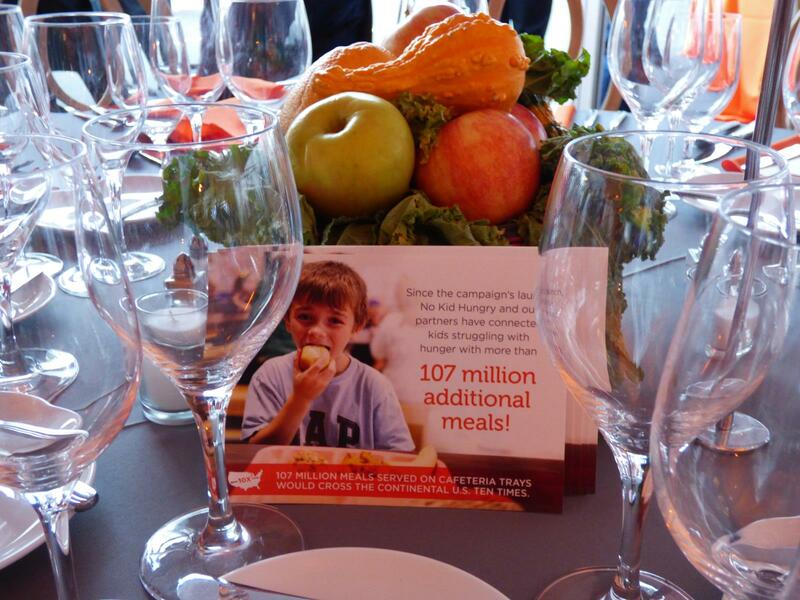 With 35 million meals already served up – No Kid Hungry is making real progress towards ending this solvable problem. This event’s presenting sponsor was Coulombe Family Foundation. 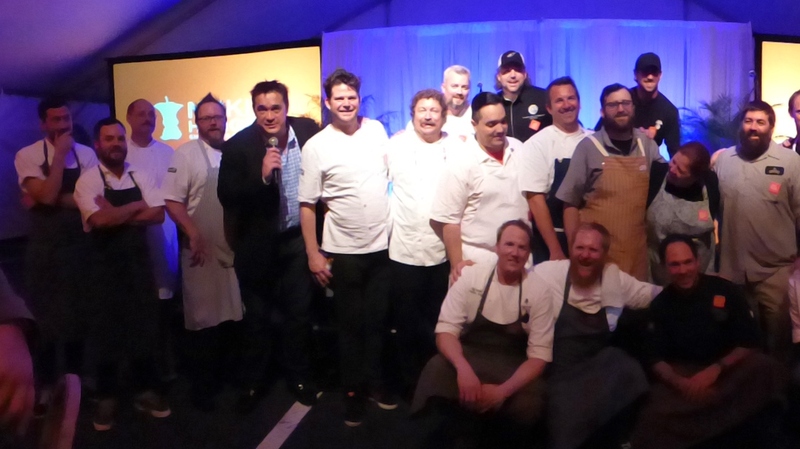 Here is a list of the restaurants/chefs who participated this year. What a great write up! I am not only impressed by the culinary community in Charleston, but also excited to learn more about No Kid Hungry and their impressive and inspiring mission. Thanks for the intro to this great organization! Thanks Merrill for your comments and interest in No Kid Hungry. They really are doing great things. Leave it to my sister Teresa. She makes me hungry with every blog. And I just ate lunch. What a great cause to be involved with. It makes me happy to see people trying to solve problems instead of ignoring them. Good luck and have fun. I can’t wait until the next blog. Thanks for all the support and love bro. Can’t wait to be covering your BBQ success in a post! I should have ordered the brussels sprouts at The Granary! Your description has me drooling; and I just ate dinner. 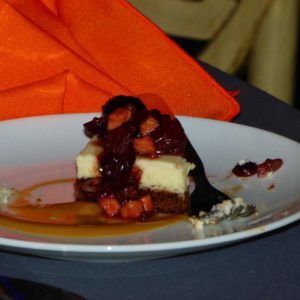 I am sorry to have missed the No Kid Hungry event, but it was great to see it through your post! 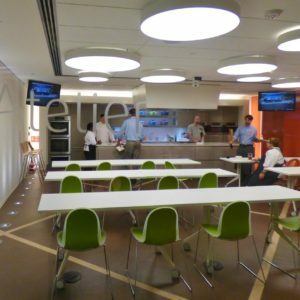 I couldn’t agree more about their being “no food shortage in America” – the perceived shortage has much to do with distribution practices, subsidies and food waste. I hope we see major changes in our lifetimes. Kudos for providing 10% of your profits to their organization! I’ll try to promote this as much as I can! Thanks for the great feedback Ashley! We had them, and can’t wait to go back in and order the Brussels Sprouts again. (I bet we run into each other there. )Thanks for helping us get the word out to raise even more money for the cause. Better, healthier food for all our kids is so important. What a great need the No Kid Hungry campaign is helping to meet.